in celebration of bojack season 4, but actually in celebration of bethy's kiddos' birthday a couple of weeks ago, i made a pony cake! 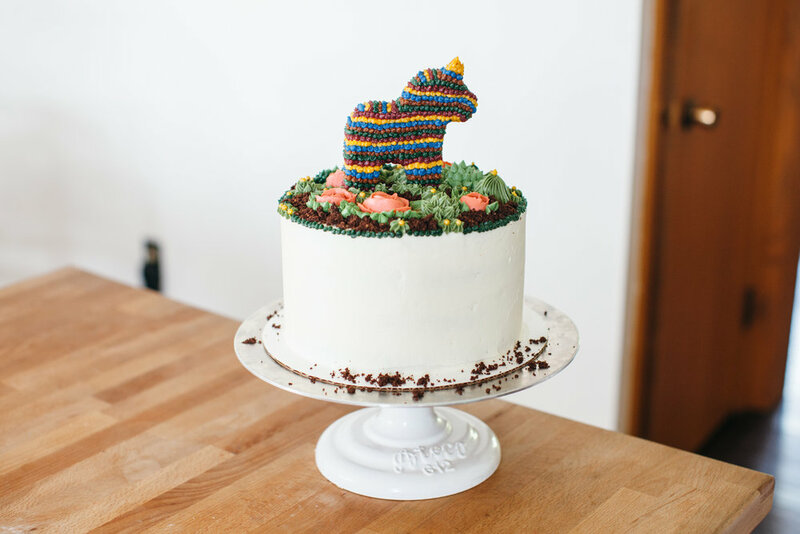 it was one of the most satisfying cakes to make because i truly can't really think of a better way to spend a sunday afternoon than by piping one million tiny frosting dots onto a miniature dala horse shaped funfetti cake and watching bojack. it's how i imagine adult coloring books are satisfying for people but this one was edible. and i think this also marked the first time i actually used my ikea mini dala horse cake pan, which i'm sad to say doesn't appear to be available for sale anymore. but i'll sell you mine for a million dollars. 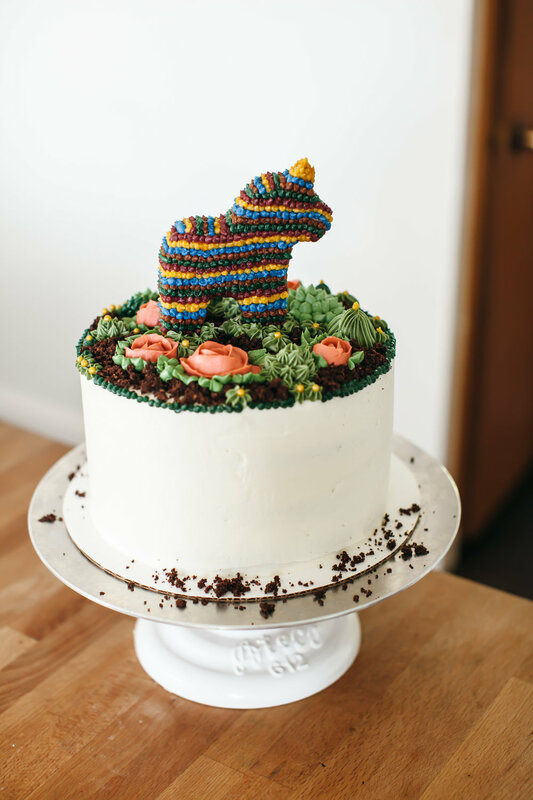 when bethy requested a piñata inspired cake with succulents, i immediately thought of this lil guy and went at it with the food coloring. she also needed a small smash cake and do you know what makes the perfect smash cake? cutting two 3" layers out of the center of a four layer cake, and do you know what makes a perfect piñata cake?! filling the center cutout with m&m's. it was a perfect win/win/win. you'll essentially need a batch and a half of sprinkle cake, a bunch of m&m's (rather, i used a mix of m&m's and trader joe's candy chocolates which are the prettiest colors), and i topped it with some edible dirt that was basically ground pretzels, cocoa powder, sugar, and coconut oil. and roses and succulents! duh. preheat the oven to 350ºf. grease and line the bottoms of four 8-inch cake pans and a mini pony pan (if you don't have a pony pan, you can leave it out). in a medium bowl, whisk together the flour, cornstarch, salt, and baking powder. in a stand mixer fitted with the paddle attachment, cream together the butter and sugar until light and fluffy, 3 to 4 minutes. add the egg whites, one at a time, mixing well after each addition. add the oil and the vanilla. with the mixer running on low speed, add the dry mixture and the milk in two or three alternating batches and mix until just barely combined, using a rubber spatula, gently fold in the sprinkles until they're evenly distributed. distribute the batter between the pans. bake until a toothpick inserted into the center comes out clean. begin checking the pony for doneness at 15 minutes and the cakes at 25 minutes. let cool in the pans for 10 minutes and then turn onto a wire rack to cool completely. in a standing mixer fitted with a paddle attachment, beat the butter until smooth and then gradually beat in the powdered sugar. add the salt, vanilla, and milk and beat to combine. once the cakes are cooled, use a biscuit cutter to cut out 3" circles from the centers of two of the layers. use these circles to make a mini cake! or just eat them. place one of the uncut layers on a plate or cake board and spread on a layer of frosting, then stack up the two cut layers on top of that with a layer of frosting in between. fill the hole to the top with m&m's, frost the top of the cake and then top it with the remaining uncut cake layer. frost it all over. decorate your pony as desired: decorate one side of him while he's laying flat on a pan, refrigerate so the frosting firms up, and then stick wooden skewers in the legs. use these to attach him to the cake, and then once he's upright, decorate the other side. add flowers, succulents, sprinkles, dollops, or any other decorations that you'd like and serve! p.s. michigan friends!! i'll be at the harbor springs festival of the book next week!! get your tickets here and let's hang!! !